Abraham Lincoln’s 1860 Cooper Union speech helped him take New York by storm in his first-ever speaking engagement—and may well have made him President. His triumph owed much not only to his actual oration at the college but also to newspaper reprints and comments as well as several printed copies of the speech, not to mention the iconic photograph taken earlier that same day. Historian Harold Holzer will explore how the "media" helped expand Lincoln’s audience from the 1,500 who heard his voice at Cooper Union to the hundreds of thousands who read about the speech, as filtered through the eyes of New York’s top three highly competitive, politically connected, and unpredictable newspaper editors. 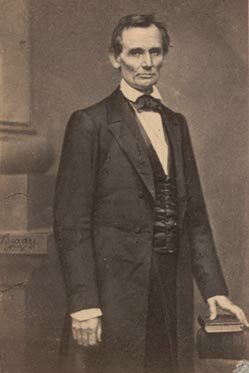 Thursday, February 19, 2015, 6:30 p.m.
Mathew Brady, photograph of Abraham Lincoln on the day of the Cooper Institute speech, New York, original: 1860, this copy printed: 1912, The Morgan Library & Museum, acquired by Pierpont Morgan ca. 1912, MA 810.21.